The falls is located at the foot of Mt. Banahaw and borders the towns of Liliw and Nagcarlan Majayjay. In Nagcarlan Majayjay, it is located in Brgy. 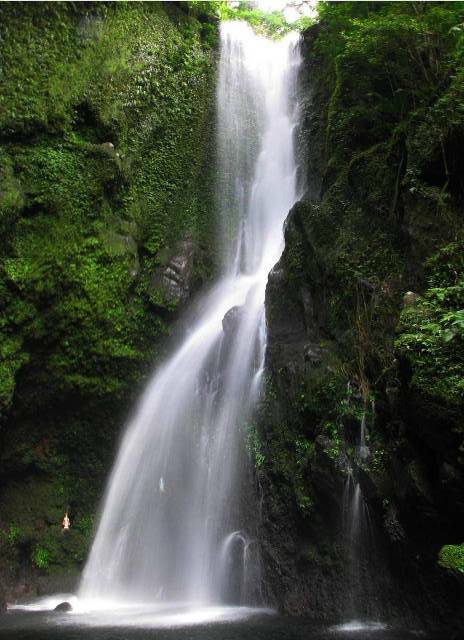 Bukal, hence the name Bukal Falls while for the Liliw locals, it is called Kilangin Falls. The Liliw trail is said to be more challenging than the walk-in-the-park trail of Nagcarlan Majayjay. Our visit to Kilangin or Bukal Falls was made possible by a friend we met during our Mt. Kalisungan climb. This climb was her birthday climb and we joked that “we’ll take care of your guests” by bringing guests with us... That was our gift to her -- guests of first time acquaintance but hopefully not the last. From Manila, we took the Rizal-Tanay-Laguna route to Nagcarlan Laguna. From Liliw, after crossing the bridge for Nagcarlan, we looked for Brgy Bukal then ask for directions to Bukal Falls... We noticed some road signs but the size were not convincing or visible enough as a guide. Our trek started at the end of the concrete road of Brgy. Bukal. The trail is a narrow pathway all the way to the registration area. The Mt. Banahaw was the scenery as we paddled our way. From the registration area, we entered a plantation leading to the trail down to the falls. It took us an hour and a half to reach the falls and WOW as in WOW-- it was indeed a hidden paradise, a hidden treasure of unspoiled beauty with waterfalls at its fullest. Fullest because the water was dripping all the way from the top and happens only during rainy season. The height of the main falls is approximately 60-80 feet that ends in a large pond. Then it cascaded to series of falls with ponds of different sizes beautifully carved in between. 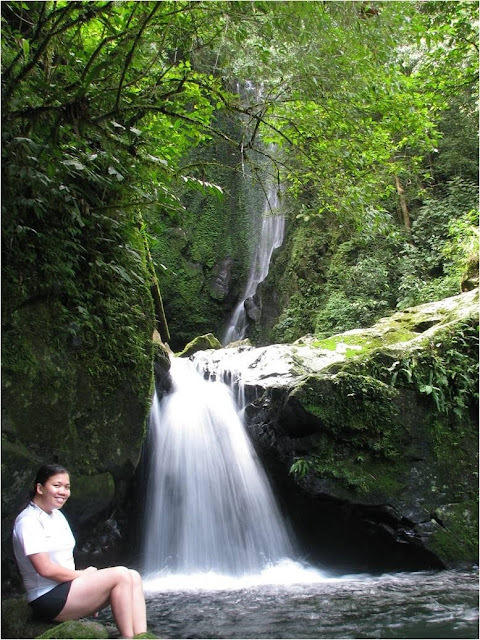 According to the locals, the water of Kilangin or Bukal falls run through Taytay Falls. So, if you’ve been to Taytay falls in the early 90’s, just imagine the coldness and crystal clear-like water that causes a “brain freeze” feeling as you dive. Truly a WOW! There is no campsite around the falls nor are comfort rooms or a private area for your personal needs. It is best advised to visit the falls on a dayhike then spend the night at a resort nearby. Guide is not necessary as the concrete walkway will lead you all the way to the registration area. From there, the locals will direct you to the pathway down to the falls. Wow! Laguna is a great place, it has a lot of tourist destination that everyone will surely like. This falls is really amazing I could say that it is one of the beautiful falls in Laguna, the place is very relaxing and also the views. Hope that one day I can visit this Kilangin Falls. Thanks. Kilangin Falls lies between the boundary of Liliw and Majajay not Nagcarlan. Somehow, thanks for visiting our beautiful Unique water fall during rainy season since the higher falls is usually dry during summer months. However it is so clean and pristine in summer. I would say Unique since it's a combination of Spring and Waterfalls in one. Hey can i have the description of the hike? Bcoz i have asthma but i really want to see that place. O was wondering if i can handle the hike up. Is it safe for solo back packer? Hi, i am an asthmatic person, do you think i can handle the hike? Or just drscribe how hard the hike is? I really want to visit that place. Thanks! Hi, allow me to share my experience as an asthmatic person myself. Yes, you can handle the hike. Actually, hiking and swimming will help and practice your lungs. Just don't forget to tell your tour guide or friends about your condition. Stop and rest a bit when you feel like catching your breath and don't forget your inhaler (puff).